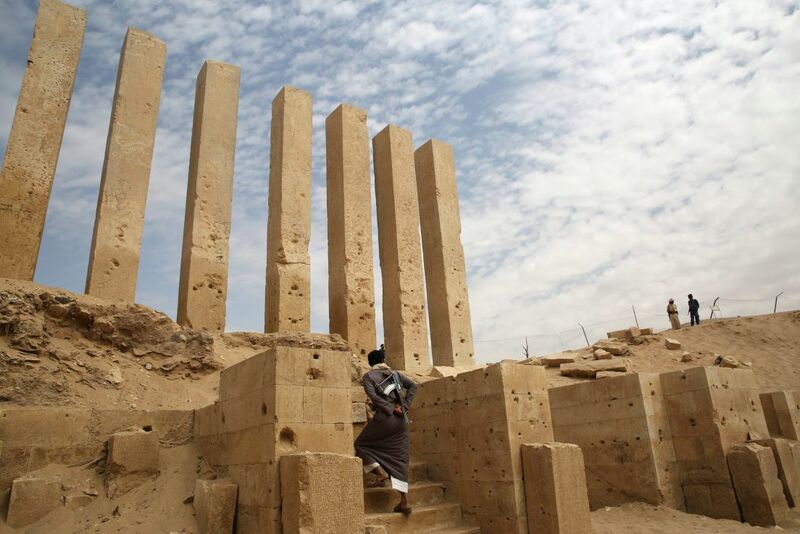 Along a narrow road in Yemen choked by natural gas tankers and heavily armed soldiers lies an ancient temple neglected and threatened in a nation now at war. 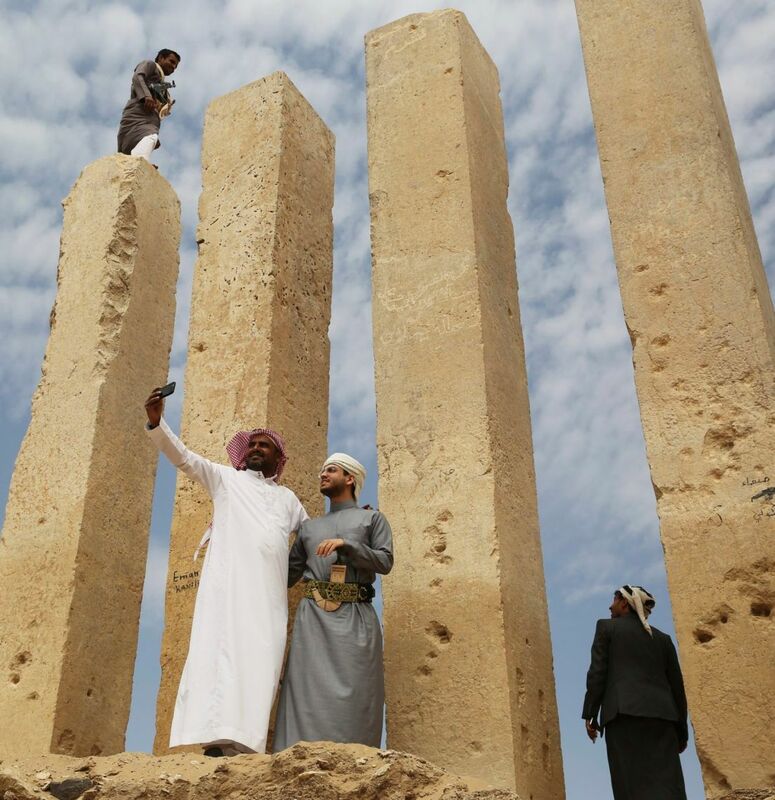 The Awwam Temple links a region now on the front lines of the Saudi-led war against Shiite rebels to Arabia’s pre-Islamic past, a time of spice caravans and the mysterious Queen of Sheba. Experts fear the temple, as well as other historic and cultural wonders across Yemen beyond those acknowledged by international authorities, remains at risk as the country’s stalemated war rages on. The nearly 3-year-old Yemen war has killed more than 10,000 people, displaced 2 million and helped spawn a devastating cholera epidemic in the Arab world’s poorest country. 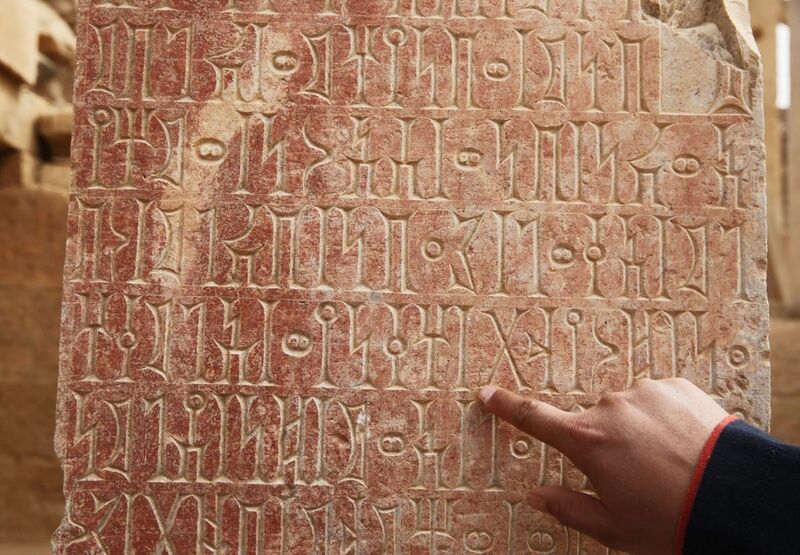 Amid its humanitarian crises, Yemen’s culture and historical sites also have been affected. Saudi-led airstrikes have destroyed historic mud homes in Saada, the birthplace of the Shiite rebels known as Houthis. Airstrikes also have hit the over 2,500-year-old Old City in Yemen’s rebel-held capital of Sanaa, a UNESCO World Heritage site for its intricately decorated burnt-brick towers. Shelling and airstrikes also have struck museums and other sites in the country. In 2015, airstrikes damaged part of the Great Marib Dam, near the Awwam Temple and built by the same civilization, according to UNESCO. Even just the shockwaves of an explosion in the distance can be enough to damage delicate structures. UNESCO has shared coordinates of some 50 historical sites with militaries involved in the fighting to try to protect them, Paolini said, though many remain unguarded now in the chaos of the war. Foreign historians and archaeologists also fled the country over the fighting, halting work at sites like the Awwam Temple, also known as the Mahram Bilqis. 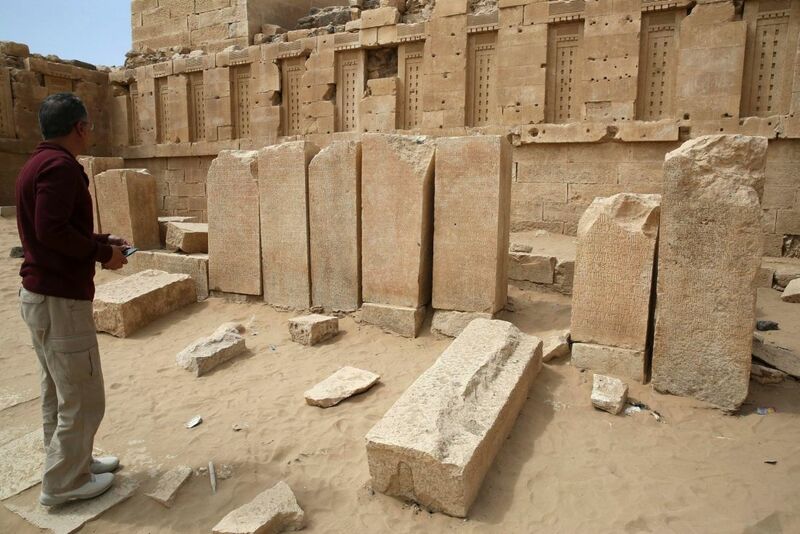 Scholars believe the temple, with parts dating to the 7th century B.C., served as a shrine to the god Almaqah. The nearby city of Marib was the capital of the Saba dynasty, which ruled the area for centuries before the birth of Christ. The kingdom built the Great Marib Dam and controlled spice and incense trade routes. The legendary Queen of Sheba, said in the Bible to have visited King Solomon in the 10th century B.C., has been linked to Saba, though Ethiopians claim her as their own. The Sabaean dynasty later succumbed to challenges from other kingdoms and the Great Dam gave away in the 6th century A.D. Islam quickly spread across the Arabian Peninsula soon after. Islam’s holy book, the Quran, blames the dam collapse on Sabaeans being ungrateful to God. Marib, which has grown into a city where many displaced by Yemen’s war now live and gunfire echoes through the day and night, has never been a particularly easy place in modern history. Famed American archaeologist and oilman Wendell Phillips began excavation of the Awwam Temple in 1951, but had to abandon all his equipment and flee raiding Bedouin tribesmen with his team. German archaeologists resumed work in the region in 1988, though foreign tourists remained a target of militants and tribesmen eager for ransom money. In July 2007, a suspected al-Qaida militant detonated a suicide car bomb in a crowd of tourists, killing eight Spaniards and two Yemenis. Today, a simple fence surrounds the temple, just off a heavily guarded road leading to a Saudi coalition air base and an oil refinery. A watchman lives in a small makeshift shack against the fence with his children. Eight limestone pillars towered over the site, though weathered, chipped and marred by the occasional bit of graffiti. 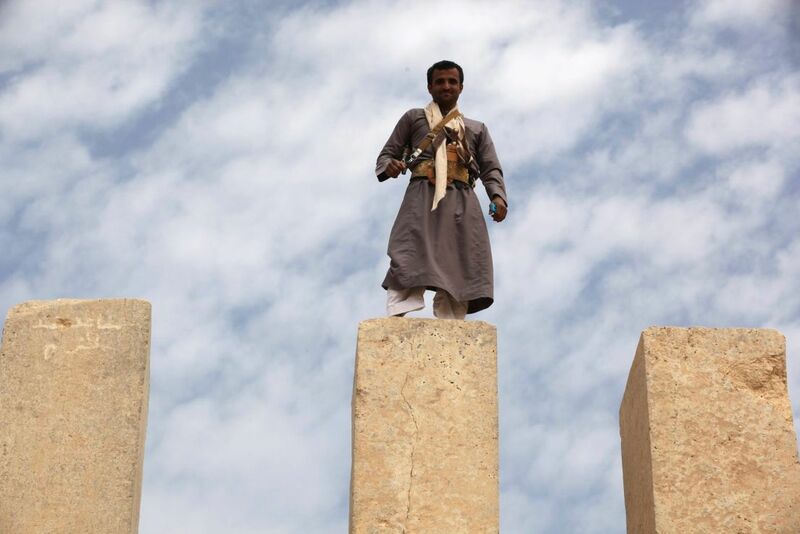 A Yemeni militiaman with a Kalashnikov assault rifle over his shoulder quickly shimmied up between two pillars, looking down with a smile at once was one of ancient Yemen’s holiest sites.